John Monnette is quickly becoming a household name around the World Series of Poker, and tonight's performance will certainly help that trend. Monnette has just completed the goal he set before himself three days ago, winning Event #23, the $2,500 buy-in eight-game mixed event. With it comes nearly $300,000 and Monnette's first gold bracelet. The day began with 25 players still in the mix -- see what we did there? --, among them some of the most skilled mixed-game players in the world. Names like Ylon Schwartz, Nikolay Evdakov, and Max Pescatori all dropped out over the course of the opening levels, and the field shrunk quickly. Midway through the day, the final eight were set, and the survivors were relocated to the secondary featured table for the conclusion of the fight. John Racener was the first of the eight to fall, his pocket kings running into the flush of Eric Buchman in stud 8/b. Racener had a full-house draw with one to come, but a brick on seventh cut his evening short with a small payday for his fifth career WSOP final table. Adam Kornuth fell just a few minutes later in no-limit hold'em, his pocket eights coolered off by the two tens of Michele Limongi. John Juanda was on life support early in Day 2, but he managed to grow his stack steadily for the last half of the event, right up until his elimination in sixth place today. Juanda got his last couple bets into a limit pot with king-high, and Buchman's flopped an open-ended straight flush draw. He made that straight right on the turn with the , and Juanda was thusly ushered out the door a few spots shy of his second 2011 bracelet. Desmond Portano fell to John Monnette in a razz hand to bow out in fifth, and Monnette took care of Brent Hanks in fourth place, too. With the knockouts mounting, it was about this time that the momentum was really shifting toward Monnette. He rode the rush all the way to victory. Michele Limongi was his next victim, Monnette waking up with aces to take the last of the Italian's chips. That left Monnette and Buchman heads up for the hardware, probably two of the betting favorites coming into play. They were playing the "H" of H.O.R.S.E. when Limongi went out, and by the time they got to the "E", the match was decided. The tides turned for good in the stud round where Monnette dominated, making a couple key hands to cripple Buchman down into the knockout zone. One hand of stud 8/b was all it took for Monnette to collect the rest, and Buchman was gracious in defeat. It took about six hours of final-table play to crown Monnette as the champion, a feat which looked improbable at one point. It was a bit of a buzzer beater, too. With just 18 minutes left on the clock, Monnette and Buchman would have been forced to bag up if they couldn't settle it quickly. 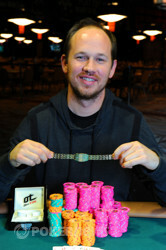 The end came, though, and it was John Monnette holding the bracelet with flash bulbs popping in the Amazon Room. He's the toast of the town tonight, and he'll join the growing group of bracelet holders when he's awarded his new jewelry on Friday. Congratulations one more time to John Monnette, the champ! Buchman brought it in with the , Monnette completed blind with the up, and Buchman raised. Monnette called. Monnette turned over the on seventh, and Buchman was drawing to a nine or a queen. He paired, but the just wasn't enough, and he was eliminated in 2nd place for $171,855. 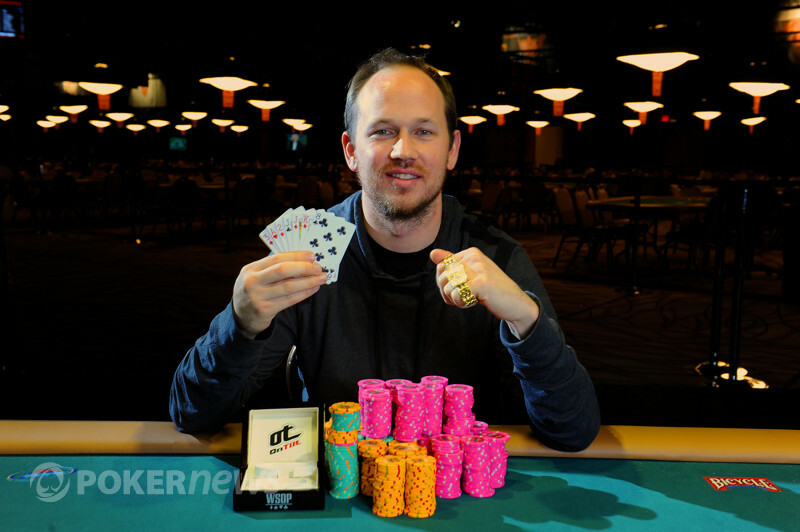 This was Buchman's third cash at the 2011 World Series of Poker, and second final table. Despite falling short of his second bracelet, Buchman was in good spirits after the match, talking with Monnette about hands and the future. "Time to get paid," he said. "At least that will ease the pain a little bit." 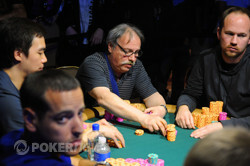 Congratulations to Buchman for another deep run at the 2011 WSOP! 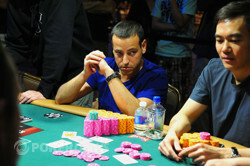 On the last hand of the stud round, things went pretty sour for Eric Buchman. John Monnette brought it in with the , and Buchman completed with the . Monnette called. Monnette quickly bet his ace on fourth street, and Buchman raised it up. Monnette called, and Buchman picked up an ace of his own on fifth. He bet again, then check-called on sixth. On seventh, he checked again, and Monnette made the last bet of 100,000. It represented a significant chunk of Buchman's remaining stack, and he toyed with the calling chips for a moment before sliding them in. Monnette showed for the wheel, and Buchman turned his palms upward and sighed. He couldn't beat it, and the losing of that pot drops him all the way down to just 203,000. John Monnette brought in with the showing, Buchman raised, and Monnette re-raised. Buchman called. Buchman check-raised Monnette on fourth street, Monnette called, and then on fifth and sixth, after pairing his deuce, Monnette led out. Buchman called both bets. Monnette checked dark going into seventh, Buchman checked behind, and Monnette opened for nines and deuces. They were good, and he shipped the pot. Eric Buchman raised the button, and John Monnette called for a flop. It came , and Monnette check-called a bet. That action repeated after the turn and river, as well. Buchman showed for the nut low, and Monnette's was not great, but good enough for the high. Chop-chop. Eric Buchman raised with the button, Michele Limongi re-raised from the small blind, and John Monnette made it four bets from the big blind. Buchman folded, and Limongi called. The flop fell , and Limongi check-called a bet from Monnette, leaving less than a big bet behind, and moved all in after the turned. Monnette immediately called, and tabled . Limongi tried to muck, but his hand was forced to be turned over because there was still one card to come. He was drawing dead with , the on the river completed the hand, and the Italian was eliminated in 3rd place. We picked up the action after the initial draw as the action was checking to Eric Buchman. We infer he was the button-raiser to start the hand, and he put out the small bet of 40,000. Michele Limongi and John Monnette both called. Limongi took two cards while the others took one apiece. Limongi checked again, and now Monnette led out into the pot with a big bet of 80,000. Buchman raised it up, Limongi folded, and Monnette called. Monnette stood pat, so did Buchman, and Monnette check-folded to a bet. Buchman drags the pot, and he's up to about 1.25 million now.